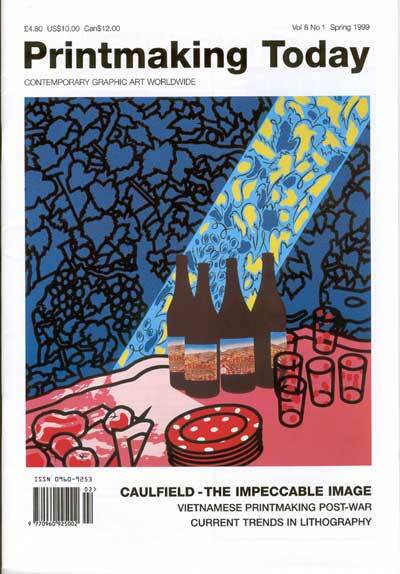 6	The impeccable image: the prints of Patrick Caulfield by Mel Gooding Maty Grunberg by Simon Brett. 10	Lebadang: an aerial vision by Anthony Janson. 12	The road to Dong Ho: Simon Redington on print in Vietnam. 14	Mixed fortunes in Mexico: Catalina 70 years by Melvyn Petterson. Durán on 200 years of lithography. 23 Five years and flourishing: Joe Winkelman on Connecticut GraphicArts Center. 30 Waterless hthography: Peter Wray describes the process. 32 Galvanography revisited by Cedric Green. 4 Stop Press: new spaces for print in London. 17	Stop Press: results of the Albany Print Club prizes. 26	Listings: exhibitions, residencies, conferences and opportunities. 29	Book reviews: Louisa Buck’s Moving Targets and new publications on Julian Trevelyan and Frederick Carter. 19 What future for British printmaking? House revisited. Elaine Kowalsky reports. 20 Back to school: Ruth Thomas artist-in-residence in the classroom. 21 Printing at the Potteries: Varvara Shavrova on a museum residency. 24 The birth of Lithonet: Dr Manuel Castro Cobos reports from Sweden. 24 New ground, common ground: the first South African Printmaking Conference by Richard Anderton and Steve Hoskins. 25 Saying and doing: Peter Ford on the Easel Graphics conference and exhibition, Kaliningrad.